This special work is laser-focused to unleash your acceptance & happiness in yourself, in others and actually help your circumstances blossom. Go get your tap shoes, hat & boa! Woo Woo Energetics which remain embedded in the audio always ready for you whenever you need them. ​I Am What I Am With Rudy Hunter is $77.00 and will never wear out--ever. Use it again & again on ANY issue you need help with. ​Turn up your speakers, press play & enjoy! ​as another gift from Rudy Hunter. 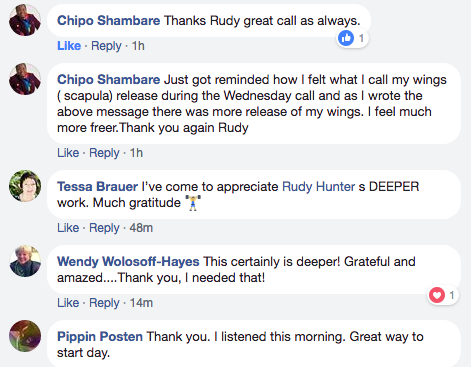 I Am What I Am With Rudy Hunter is an energetic workhorse that will ALWAYS be there for you. ​It meets you where you are and helps you expand. The embedded energetics in the recording will never wear out and will last a lifetime. It is a valuable tool priced nicely at just $77.00. Use it often to make life easier, more accepting and filled with more joy.